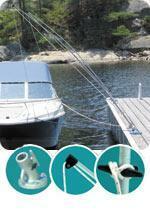 Dock Side Premium mooring whips by Dock Edge are solid fiberglass for strength and durability. These whips are built in multiple stages with the company’s exclusive cross-wound fiberglass for extra rigidity. Boatersland Discount Marine Supplies has the complete line of Dock Side Premium mooring whips at competitive prices. This 12-foot mooring whip – product number DEI3400F – is geared toward boats that are up to 33 feet in length and up to 5,000 pounds. The premium mooring whips feature Dock Edge’s exclusive Plug and Socket design and a cast aluminum base that has a built-in cleat, ring and thumb screw. The Plug and Socket design allows for easier separation. When researching mooring whips, you must be sure that you have purchased the appropriate Dock Edge mooring whip for your application. A couple of factors that are most important when deciding the best mooring whip for your needs are weight and water level variations. As an example, it would not be advisable to use a 12-foot mooring whip if your boat weighs 20,000 pounds. Be sure you have all of the data on your boat when deciding which mooring whip to purchase.